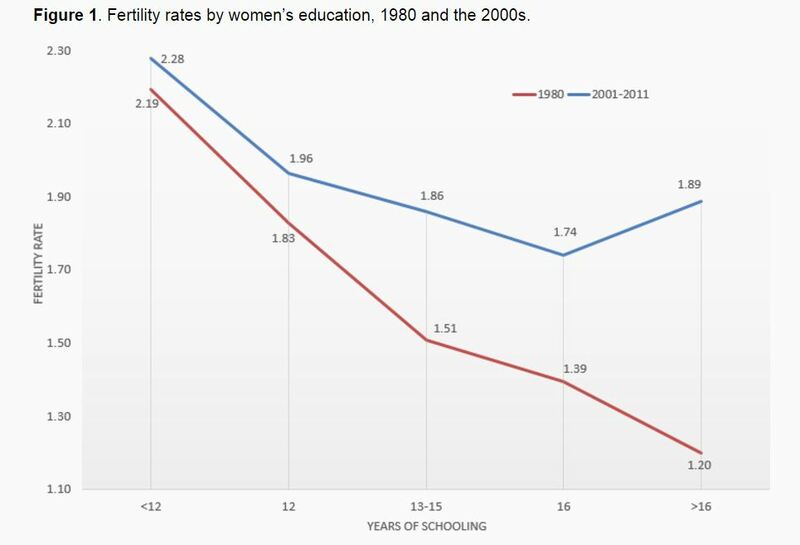 Why are highly educated women having more children? The results of this study have several implications. For public policy, it highlights the potential benefits from pro-immigration policies. Unskilled immigrants can potentially have a positive effect on fertility via an increase in the supply of cheap home production substitutes. For many developed countries that are facing ageing and shrinking populations, this may be something to consider. It also has consequences for economic growth. Given the strong correlation between parents’ education and kids’ education, an increase in the relative representation of kids coming from highly educated families means that the next generation is going to be relatively more educated. This is good news for economic growth. Galor, O and D N Weil (1996), “The gender gap, fertility, and growth”, American Economic Review86(3): 374–387. Hazan, M and H Zoabi (2015), “Do highly educated women choose smaller families?”, EconomicJournal 125(587): 1191–1226. Mincer, J (1963), “Market prices, opportunity costs, and income effects” in C F Christ (ed. )Measurement in economics: Studies in mathematical economics and econometrics in memory of Yehuda Grunfeld, Stanford University Press, pp. 67-82. Authors: Moshe Hazan is a Senior Lecturer of Economics at Tel-Aviv University, a Research Fellow at the CEPR and an Associate Editor of Macroeconomic Dynamics. Hosny Zoabi is currently Assistant Professor at The New Economic School, Moscow, Russian Federation. Image: Children read books at Montevideo’s Independencia square while participating in the activity “Al Aire Libro” that encourages reading in public spaces. REUTERS/Andres Stapff.